You know how much I love pasta in combination with a creamy sauce. And to achieve a little variety on the table and that it does not taste all the same, I have created a new version again. 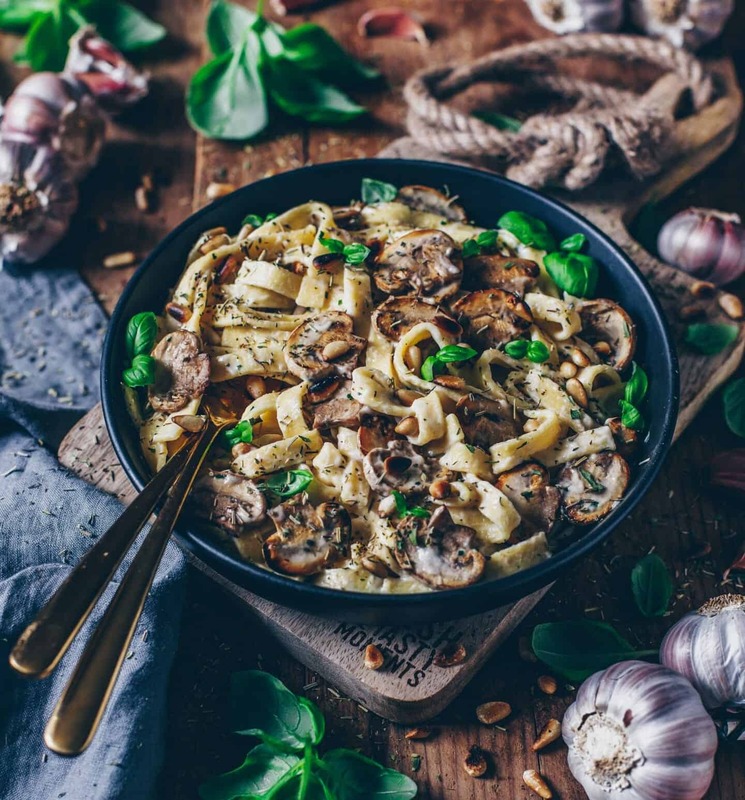 This time, I made a vegan creamy ‘mushroom sauce’ or ‘béchamel sauce’ from white beans. White beans can be processed in just a few steps and with only a few ingredients, you‘ll get an incredible creamy sauce. 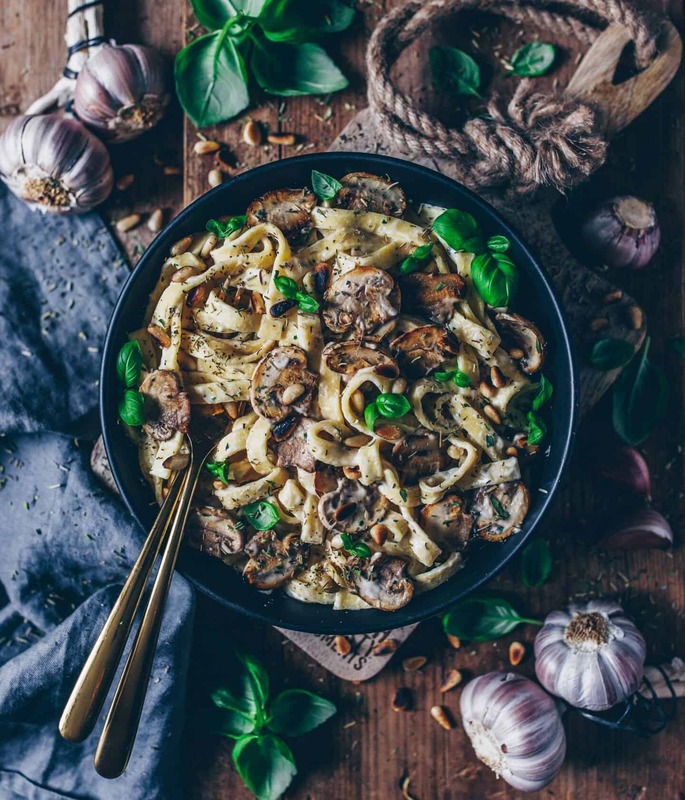 Other great ways to make a vegan cheese-like or creamy sauce, for example, is the recipe for vegan ‘Mac and Cheese‘, which is mainly made of potatoes or for a even faster and easier version the recipe for a vegan ‘Alfredo Sauce‘, which is only based on cashew nuts. I think all options aren‘t only delicious and healthy, but also really cheap, because vegan milk and cheese alternatives can be quite expensive when you buy them in the supermarket. 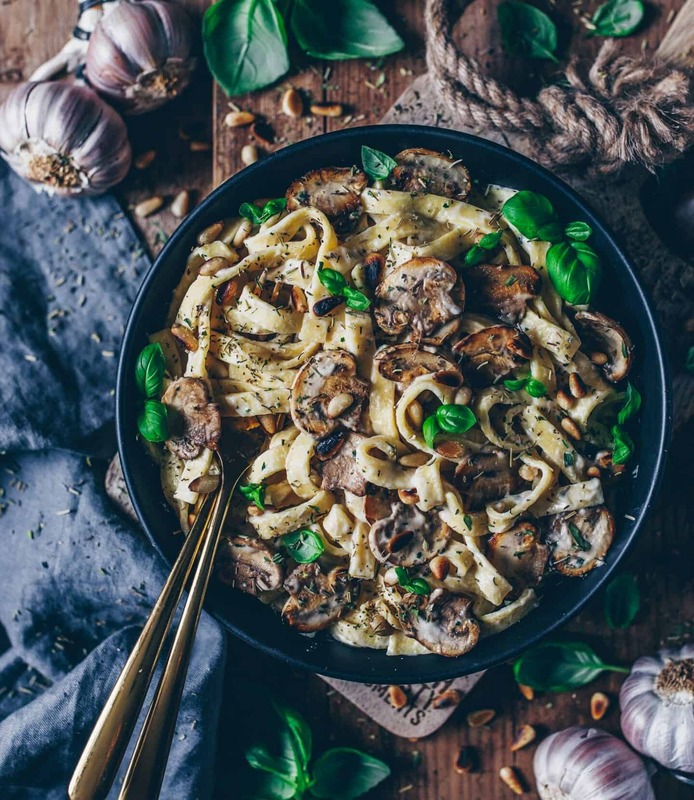 This recipe is of course dairy-free and needs only 6 ingredients, many of which can be found in just about every vegan kitchen. I like the sauce most served with pasta and aromatic fried mushrooms. Of course, you can also add any other vegetables as desired to make this dish complete and nutrient-rich. Peel and dice the onion finely. Clean mushrooms and cut them in slices. Rinse and drain the white beans and blend them with soy cream, chopped garlic cloves, yeast flakes in a food processor. Heat the oil in a pan and sautée diced onions for about 2-3 minutes. Then add the mushrooms and fry. In the meantime, cook pasta in salted water according to the packaging instructions. Once the mushrooms are fried golden brown, add vegetable broth, tamari sauce and the bean puree. Bring to a boil and let it simmer for a few minutes. Season with salt, pepper to taste and refine with nutmeg and fresh parsley, if you like. Roast pine nuts in a pan without oil until golden brown. Once the noodles are ,al dente‘, drain off the cooking water. Looks delicious! What kind of vegan pasta did you use? I used normal pasta made of wheat flour I bought in our organic supermarket. I tested a recipe, it was simple and yummy ! I do recomand ! Thank you for the inspiration ! This recipe looks so tasty. But I usually don’t use soy milk. Would it be okay to substitute soy milk with almond milk? Yes sure! You can use plantbased milk of choice ? White beans are really a great replacement for traditional Béchamel ingredients, I was nicely surprised! Thank you for the recipe, it was simply delicious! Thank you for the positive feedback!?? I‘m happy to read that you like the recipe ? I tried this recipe recently and absolutely loved it! Was so good to finally find a vegan creamy pasta recipe that was not only easy to make but tastes delicious too! So glad to read that you liked the recipe! ? Thanks! 🙂 I loved it! and I think it’s a nutritionally balanced recipe. Just perfect! 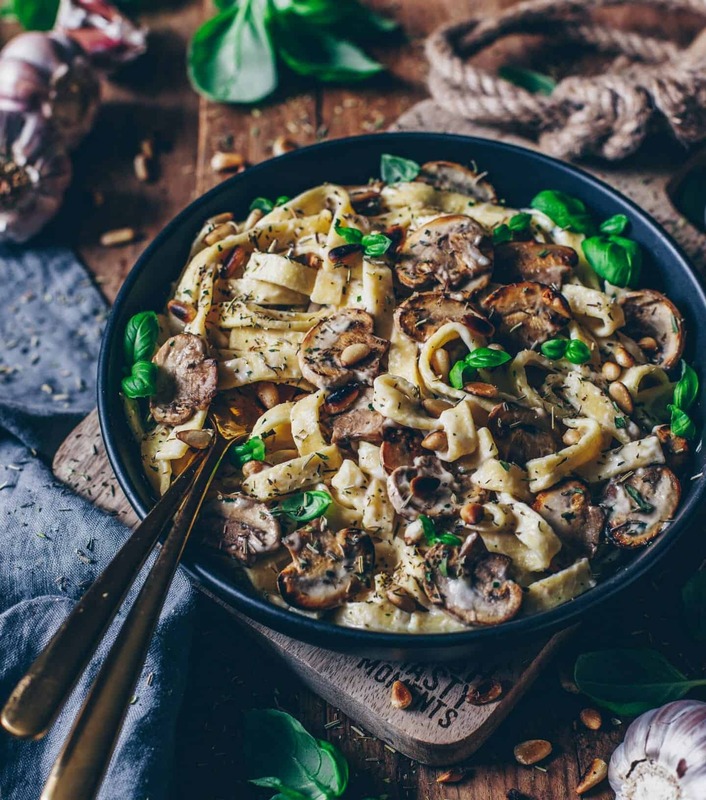 I tried this recipe (or one VERY similar to it) last night and although it came out really well, when refrigerated, it becomes a bit of a nightmare to eat the next day because the pasta becomes really clumped together. Any advice to avoid that? So glad to read that you liked the recipe. However, it’s absolutely normal that pasta gets sticky and clumps together when you place in the fridge overnight. Best is to store the sauce separately in a jar or bowl and cook pasta always fresh. Otherwise you can also combine fresh cooked pasta with a bit of olive oil before placing in the fridge for the next day.